Mt. Pisgah on the Blue Ridge Parkway can be seen from downtown Asheville on a clear day. It's easy to pick out since it has a large transmission tower on the top! It's just 26 miles southwest of downtown Asheville in the Pisgah National Forest. 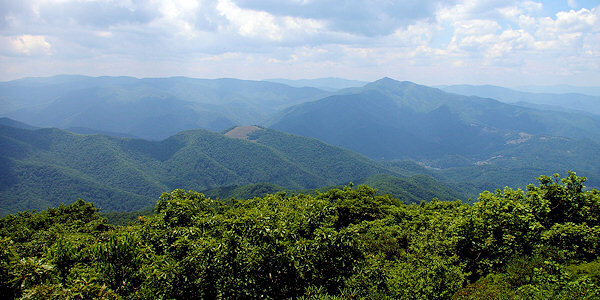 Enjoy panoramic views, including the best view of the famous Cold Mountain. Also find a restaurant, campground, craft store and more. 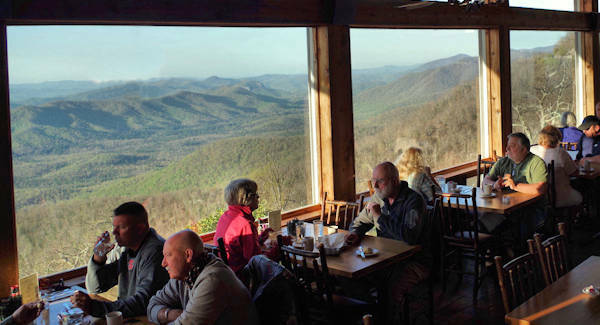 The only restaurant on the Blue Ridge Parkway near Asheville (Milepost 408.6) provides panoramic mountain views from 5,000-ft. elevation. It is open April through October, 7 days a week, with breakfast at 7:30-10:30 AM, lunch at 11:30 AM-4 PM and dinner at 5-9 PM. The diverse menu is reasonably priced. They do not take reservations. Sometimes they keep a list for 5 PM seating (busiest time). Expect a wait on busy weeks and most of October. We love to stop there for a hearty breakfast before a hike - or pick-up a picnic lunch to-go. Next door is a great craft gift shop. They also have overnight rooms, but they book up well in advance. 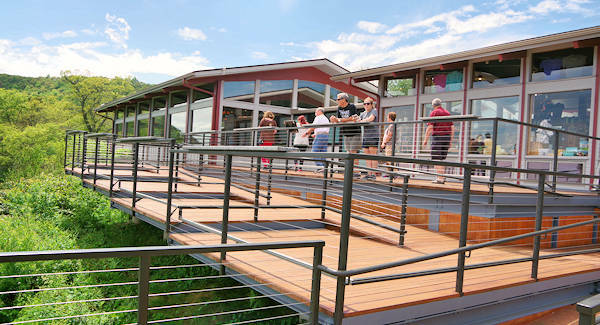 A large observation deck outside the restaurant and gift shop provides panoramic mountain views for all to enjoy - completely accessible. The popular 1.5-mile (one-way) strenuous hike to the 5,721-ft. summit provides lofty views. Coming from Asheville, look for the parking area on the left before you reach the Pisgah Inn (Milepost 407.6). A large picnic area includes grills, tables and restroom facilities. The trail starts at the back of the parking area behind the large sign. At the parking lot, you are just shy of 5,000 ft. in elevation and you are in the midst of the high-elevation northern hardwood forest. You will hike in this forest, dominated by oaks, all the way to the summit. You climb all the way, and the second half is the steepest with lots of rock steps to climb up. It's a rocky trail, so wear good walking shoes. At the summit, you'll find the transmission tower for WLOS-TV Channel 13 from Asheville and an observation deck. Try not to let the transmission tower ruin the wilderness feel. The view is spectacular. 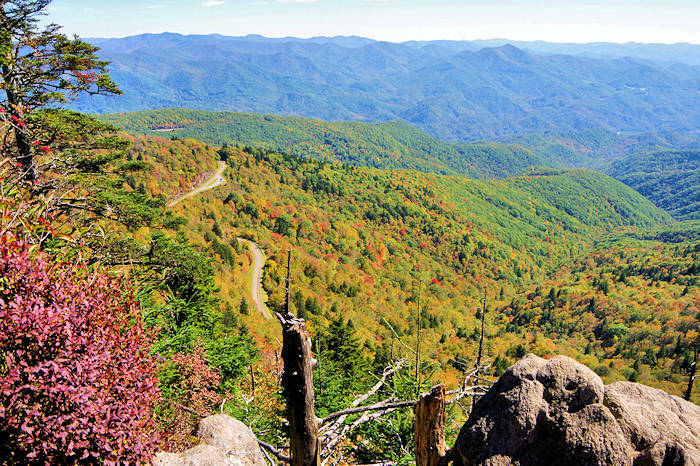 On a clear day, you can see the parking area, the Pisgah Inn, the Shining Rock Wilderness to your west with the famous Cold Mountain at its northern end, the Great Smoky Mountains far to the west, and Asheville and Mount Mitchell to the North. 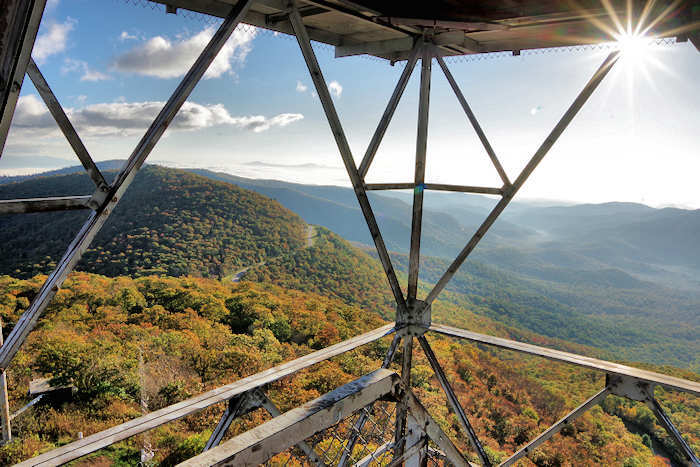 For a longer hike, take the six-mile round-trip hike to Fryingpan Lookout Tower, an old fire lookout tower. This trail turns to the left, shortly after you begin the Mt. Pisgah trail. A shorter hike (two miles) to Fryingpan Mountain Trail begins down the Parkway at Milepost 408.5. It goes to Big Bald, a great wildflower area. Then continue on FR 450 to the fire tower for views. Read more about Fryingpan Tower, including a shorter hike to the tower. In addition to the 52 sites available for advanced reservation, 74 campsites are available on a first-come, first-serve basis. Find both RV and tent sites. Amenities include fire rings, laundry, flush toilets, showers, a dump station and a country store. Also, check on ranger programs. Open mid-May through October. Reserve online or call 1-877-444-6777. Take the Blue Ridge Parkway south from Asheville. From the NC Highway 191 exit at the NC Arboretum, it's 14 miles (or 30 minutes). See our Blue Ridge Parkway Guide for a mile-by-mile list of places to stop. 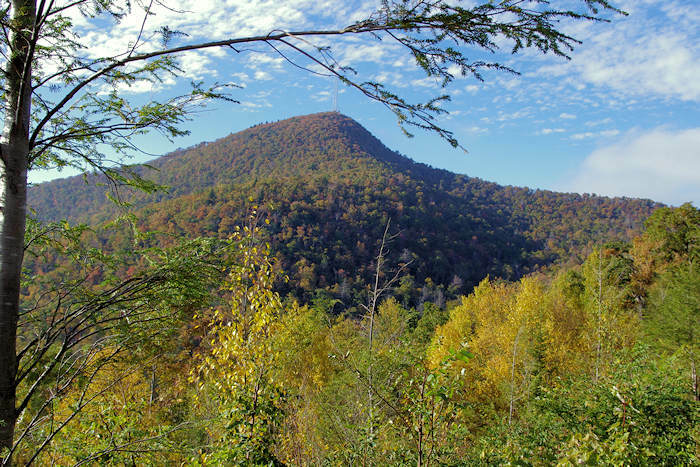 Mount Pisgah is named after the biblical mountain from which Moses first saw the promised land. The name dates back to the early 1800s. The Cherokee name was Elseetoss. Most this area of Pisgah National Forest was part of the Biltmore Estate! Today's entrance to the estate is 23 miles away. George W. Vanderbilt built his Buck Spring Hunting Lodge on the mountain (razed in the 1960s). He constructed the 16-mile Shut-In Trail in the 1890s to climb the Pisgah Ridge to his lodge from the estate. 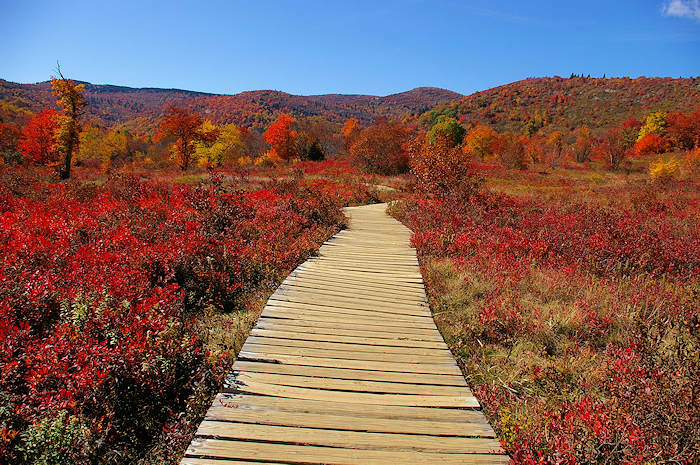 This trail, still in use today, closely follows the current Blue Ridge Parkway. Vanderbilt created the country's first school of forestry nearby at the Cradle of Forestry. There you can tour many historic buildings, hike and learn all about Vanderbilt's groundbreaking work in forestry. 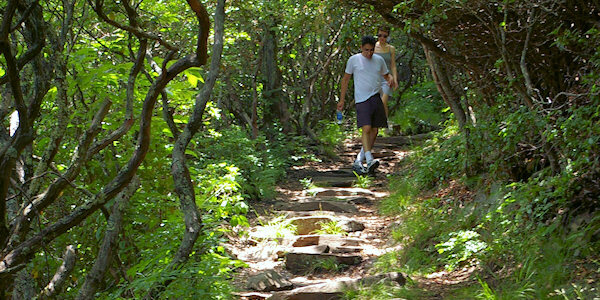 There are many hikes hidden along the Blue Ridge Parkway that takes you through lush forests, by waterfalls and to mountaintops with sweeping views. See our Top 15 Parkway Quick Hikes with big rewards.